The RMH Group (RMH) is proud to announce that company president Bill Green, P.E., DBIA, LEED AP was named as one of only 20 industry leaders chosen to be in the 2018 inaugural class of Design-Build Institute of America (DBIA) Fellows. Designated Design-Build Professional Fellow status is the highest level of DBIA Certification and acknowledges the achievements of the nation’s most accomplished design-build professionals. 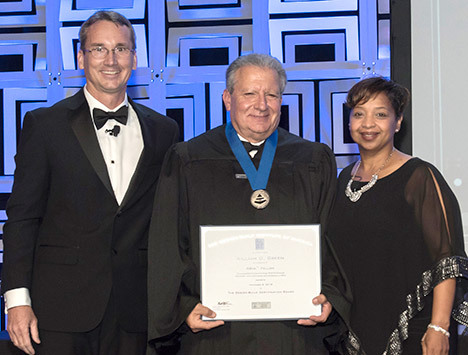 Green was inducted into the 2018 inaugural class of DBIA Fellows during a ceremony held on November 8, 2018, at the 2018 Design-Build Conference & Expo in New Orleans, Louisiana. Green has been active with DBIA since 1994. He served as founding president of DBIA’s Rocky Mountain Region in 2002 and currently serves on the DBIA Rocky Mountain Region Board. Green also served on the DBIA National Board of Directors as Chapter Liaison from 2003 to 2005 and then served as a regular Board Member from 2005 to 2007. In addition, Green was on a task force that wrote the DBIA Design Management Guide.